OBRA Incorporated, a fully registered non-stock Cultural Association is composed of patriotic individuals from diverse fields and passion in arts who organizes events and produces works with correlated art forms to gather Pinoy Artists with one primary goal: "To cultivate skills and talents who were not given the opportunity, but a wealth of potential and passion for the Arts." is on our hand as an artist with the help of God. Let us support the projects and the organization. or through OBRA's bank account. 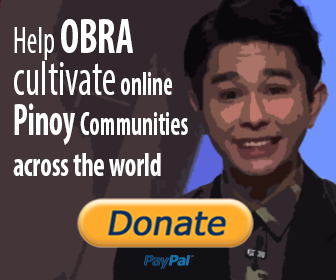 Proceeds will be used in theOBRAwebsite site maintainance and projects organized by OBRA Incorporated and its affiliates. If you still have any questions or inquiries, feel free to contact us.